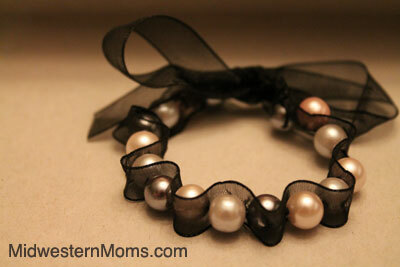 For my girl gift idea, I decided to focus on creating a ribbon bracelet. Since I save everything in my house for a potential craft project, let’s just say that it was easy for me to find some broken necklaces that contained these beads. 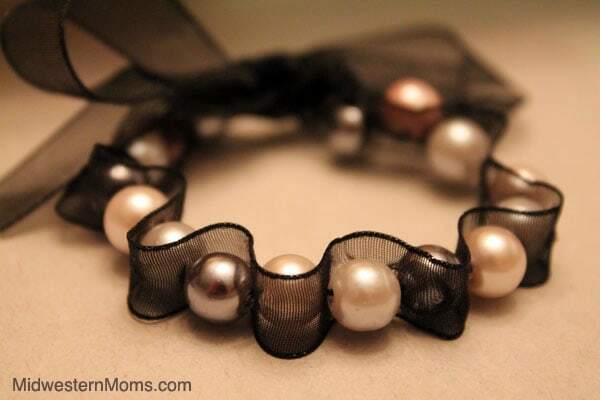 This is a very quick project that is fun and also looks very cute on girls. Step 1: Gather your supplies. I put mine in a box so that the beads don’t roll all over the place and nothing gets lost. With small dogs and children in the house, I like to try to prevent any of my craft projects from being eaten. Step 2: Thread your needle with the embroidery floss. Embroidery floss comes in 6 individual strands wrapped in one, so you can separate them as you need for your projects. For this project, I pulled 4 strands and threaded them through my needle. You will then knot the end of your thread and begin to thread your ribbon. Step 3: Continue to thread the beads onto the ribbon. I chose to thread mine front to back to get the effect of the ribbon going through the beads, however you can also bunch the ribbon between the beads if you wish, as shown in this inspiring tutorial that I found at Oh So Crafty. 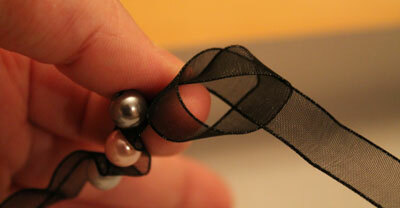 When you get a few beads on, knot the end of your ribbon as close to the last bead as possible. I also tie my thread through this, giving it extra stability. Step 4: Once you are complete and have the bracelet the desired length that will fit around the wrist of the girl you are making it for, tie off the other end. Tie the ends of the ribbon in a bow and trim the ribbon to an angle. I always use Fray Check or heat seal the ends of the ribbon so they don’t unravel. To heat seal simple run the end of the ribbon across an open flame quickly, being careful not to set it on fire. I hope that you have enjoyed our girl craft for the day! This is so cute..and elegant. That’s really cute! Love the idea! Hi! This is so cute but Ive been having a lot of trouble with it! Do you use bigger beads/ribbon? 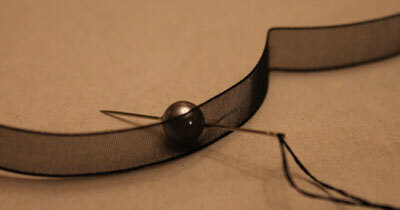 Im using smaller pearls and I just cant seem to gather the ribbon well. I also cant keep the bracelet from twisting…help! The beads that I used I would consider to be pretty big. They were almost the same thickness as the ribbon. That might help you some when gathering.